Rescue certification takes you to the next level of diving. Sometimes unfortunate things can happen to divers and one person from a dive group should know what to do in such a case. Things as simple as a leg cramp can either be fixed or spin out of control into panic and distress. Learn what to do in many emergency situations. 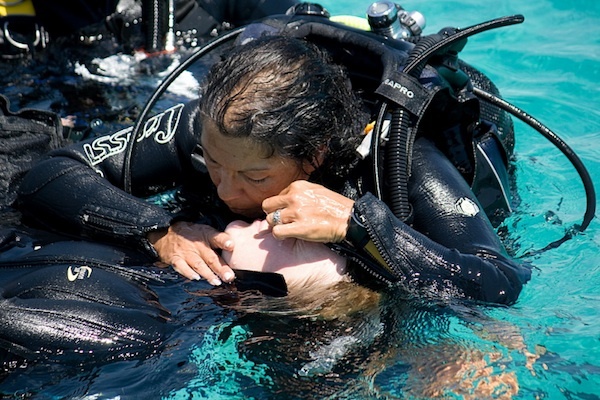 You will learn how to perform mouth to mouth while on the surface and out of the water, calm distressed divers on and off the boat, and organize an action plan to get to help safely. The SDI Rescue Course consists of five knowledge development sections using the SDI Rescue Diver Manual along with the SDI Rescue Diver Video. There are knowledge reviews at the end of each chapter and a test at the end of the course. There are confined and open water sections. Self Rescue Exercises and ten Rescue Exercises will be practiced in confined water along with your SDI Instructor, then demonstrated in Open Water. There are 2 Open Water Scenarios to be completed after all 10 rescue exercises have been mastered. Each student will be required to complete an Emergency Assistance Plan. Each student is required to have EFR Primary and Secondary Care certifications within the past 24 months. These courses can also be taken along with the SDI Rescue Diver Course.